PLEASE DESCRIBE WHO OR WHAT INFLUENCED YOUR DECISION TO JOIN THE MARINE CORPS? I also loved the image of “First to Fight.” The Navy turned me down due to poor grades in high school but the Marines took me in 1967 right after high school. I’m so glad they did. 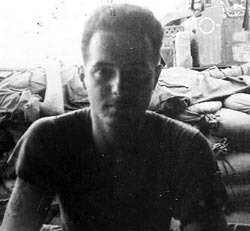 Combat Engineer attached to Fox 3/5 for most of my tour Dec 21, 1967 to June 21, 1968. 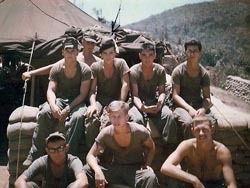 I was medically retired from service June 21, 1969 due to the extent of my combat wounds. I spent 12 months in the hospital. First at Phu Bai 1st Medical Battalion, 1st Marine Division then DaNang for 1 day, then Yokosuka Naval Hospital for a month or so. Then Wright-Patterson AF base Hospital where they had a nerve graft surgery team that worked on putting my left arm back together. Then the rest of the year at Philly Naval hospital where they did therapy and finally my med board. I was medically retired June 17, 1969 with 100% disability. I’m on the right in this picture. Hue City was the big one. Being attached to Fox 2/5 during the Battle of Hue was a life changing experience. We were dropped in by Chinooks on day 2 and lost many of our marines trying to get from the choppers to MACV. 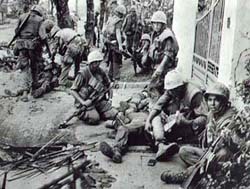 We fought in and around Hue for 41 days. Sometimes day and night. G Co 2/5 and H Co 2/5 were on the modern side of the Perfume River. One night we stayed at the Ohio University branch campus. I slept in a dental chair! What a strange event. Being a Combat engineer I spent most of my time blowing up bunkers, buildings and blowing up bridges. Even blew up a bank. The carnage was incredible. Even before we arrived there were bodies everywhere. American, Vietnamese, civilian and animals everywhere. I hear estimates that we killed some 6,000 NVA. I’ll never forget Hue. This is my squad. Rated R for Violence. Read at your own risk! My combat experience and how I dealt with it probably was not much different than many others. 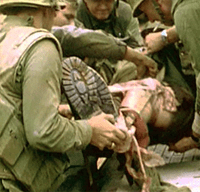 I was only in Nam a couple of days when a South Vietnamese soldier tripped a booby trap and was killed. The first time I had never seen someone die. He was not dismembered and there was little blood and the experience seemed eerily surreal. I was a Combat Engineer and a demolitions expert and mines and booby traps were my specialty. I felt as though if I had been where this man was I could have prevented his death. A couple of days later we were mine sweeping a dirt road between a place called An Hoa and a fire-base called An Loc when we found that a large hole (50 feet in diameter) had been blown in the middle of this road. Loose dirt was everywhere and the V.C. 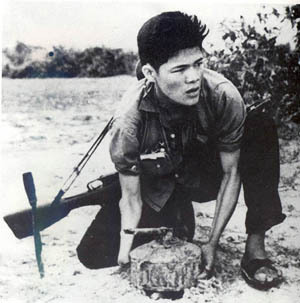 (Viet Cong) had a bad habit of doing this and planting mines in the loose dirt because they were harder to detect. We had the infantrymen set up a defensive perimeter and my partner Clyde Dillenberg and I began to probe for mines. Laying on our stomach to reduce our profile to explosions we would carefully push our bayonets into the loose soil, feeling for solid resistance while being gentle enough to avoid setting off any mines. Clyde and I were carefully and systematically clearing a path through this area when the lieutenant walked by me. I thought; what is he doing? He knelt down just a few feet in front of me and began to probe. I looked up just as he pressed his bayonet into the ground and BOOM. The explosion knocked me backwards. I landed on my back about 25 feet back into the crater. As I looked up I saw the LT’s body flying through the air above me. He must have been at least 20 feet high. He landed about 15 or 20 feet further up the road from where the explosion took place. Pieces of his flesh and bone and blood were all over me. Everyone said that he must have seen something because he suddenly walked purposefully directly to the spot where he knelt down and started probing. I immediately began probing again to clear path to him so we could get him medical attention. When we had secured an area safe for the medical corpsman to come up to him the sight we found could only be described as unthinkable. Here was a man I knew with one leg ripped off taking with it the hip exposing his intestines. The other leg was blown off above the ankle and shredded flesh hung in ribbons from the exposed bone to the knee. The arm he was probing with was gone to just below the shoulder again exposing the bone from above the elbow to the armpit. The other arm was blown off rather cleanly around mid-forearm. We found him face down and rolled him over to expose the most horrifying sight I have ever experienced. His forehead and cheeks had gaping holes in them and both eyes were gone. The rest of his face was intact. The rest of his torso was mostly intact. Immediately assuming he was dead I informed the Doc (Medical Corpsman) that there was no need to hurry because he was dead. Just then he (the LT) groaned. It was chilling. Then he began to talk. I was both horrified and saddened to think this man was still alive in the condition he was in. Doc called in a medical evacuation and we cleared the rest of the area of mines so a chopper could land and pick up the LT. There was little we could do but watch and listen to this hunk of mutilated flesh talk asking for help. He could neither see nor hear us talking to him but he kept calling out to us to help him. I began to wish for his death so he would stop talking. We picked him up by the limb fragments and put him on a stretcher and loaded him on the helicopter. He died three days later. I was 19. New Year’s Day, 1968. There were to be many other days and many other horrors for the next 6 months. I chose to share this experience as a part of my journey back from 40 years of healing. 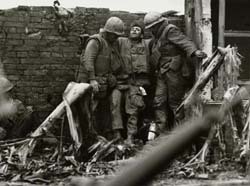 I was mortally wounded that day but not by mortars, mines or bullets. The wounds to my mind started that day and continued to become more and more severe over the next six months. I was wounded by enemy mortar fire in late June and medically evacuated ultimately back home and medically retired. From the time I was evacuated until more than 10 years later the severity of the mental wounds began to show up in increasingly more bazaar and violent ways. In 1979, I found the true beginnings of healing from my mental prison. My wife and I had always made it our practice to attend Church regularly but it had little effect on my mental state until one summer morning when I met some folks who were involved in the same business we were in and they began to talk about their faith in ways I had never heard. They talked of being “Born Again” and of an intimate personal relationship with Jesus. As they spoke I realized that I had been desiring a deeper faith and felt drawn to the Jesus they spoke of. They prayed with me and I invited Jesus into every area of my life. Healing emotionally began immediately. Although dramatic changes began that day the changes took several months to reach a level where I knew I was truly free. I still have some spells where I get emotional and uncomfortable when spending a lot of time thinking about those months in Vietnam. The hate, bitterness and anger are long gone. The violent incidents, long gone as well, the headaches loss of reality and flashbacks, also gone. I have functioned as a whole man for many years. Although my physical scars remain and somewhat limit my mobility, I am free indeed. My hope is that by sharing this bit of my life here with my Brothers that maybe one of you will find some healing as I have. A difficult journey starts with one step. Start today. Hai Van Pass between DaNang and Phu Bai. This was our field base from Jan1968 to Jun 1968. We ran all operations out of there. It was a respite from combat operations and a place to just cool it. Typically we were there anywhere from 1-2 days to a week between operations. 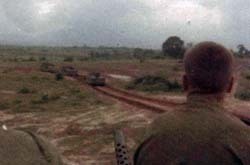 The Battle of Hue, my first day in combat and the day I was wounded. Each were very dramatic. My first day in combat I was on a mine sweep on Liberty Bridge Road. When a new Lt. blew himself up trying to help us probe for mines on that road. Hue City was the longest and most brutal operation in my tour. The day I was wounded was Midnight of the Vietnamese New Year. Daybreak. It has been raining most of the night and we are wet and cold even though it is in the upper 70s. We mount up with the rest of Fox Company 2nd Battalion, 5th Marine Regiment to do a sweep 13 clicks (Kilometers) west. Very hilly and we are carrying full gear and demo (Demolition supplies, C-4, det cord, fuse, blasting caps, fuse lighters.) About 65 lbs of gear not counting rifle, ammo, canteens etc. We force-march (fast walk) 13 clicks west up and down steep hills through dense jungle. Midday. No enemy encounter. We get a call from Battalion HQ. “Get back to LZ (cleared Landing zone) to be flown to a hot situation.” We double time the 13 clicks back at a slow to medium run. The Chinooks are waiting when we reach the LZ. We pile in. We can rest a few moments before making sure our battle gear is ready. “We are going in Hot.” We fly over the City; it is a big modern city with multistory structures. Hue, the provincial Capital. The 2nd largest and most modern city in South Viet Nam. We fly down the Perfume River and over the bridges. Heavy gunfire from the ground and from our Choppers. Hue City is divided in two by the Perfume River. The Modern City holds all the Government buildings and a Branch campus of Ohio University. The other side holds the Citadel (an ancient Castle built in the pre-colonial days). We land in a small park. The Gate drops, everybody starts running out. Machine guns fire on us as we run. We hit the ground and do squad rushes until we make it to the MACV compound. Safe inside, after dragging and carrying our wounded and dead brothers to safety, we collapse for a few minutes while the skipper (Captain Mike Downs) checks in with Battalion and the other company COs as we check on and treat our wounded. Hotel Company, Echo Company and Gulf Company will join up from three directions and try to capture the modern side of the City. The Battalion CP orders us to go down the street along the river to the provincial Capital HQ. As we were to find out much later, several NVA Divisions have overrun the City overnight and now control everything. They have killed anyone associated with the South Viet Nam Government or the U.S. Thousands of bodies were recovered later from mass graves. The streets are littered with rubble, blown up vehicles and bodies. An NVA flag is flying on the flag pole just six blocks away at the Provincial Capital office building. This section of the Modern side of the City has several important Government buildings now held by the NVA. Our objective is to find a way to recapture the Capital buildings. Everywhere we attempt to go we are met with overwhelming fire. We finally start down the back yards of some Government official’s mansions. Ahead we see several NVA run into a bomb shelter in a backyard (a grass covered mound covering a concrete bunker with doors at both ends). Engineers up! Cpt. Downs wants us to blow the door off one end of this bunker. We sneak up under cover fire and throw a satchel of C-4 against the door and run. Kaboom! The doors blow off both ends and a huge fire ball comes out of the bunker on both ends. When the fire goes out we go in to find 5 charred NVA officer’s bodies. The bunker had held something explosive and our explosion detonated whatever was inside. 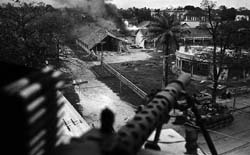 Across the street the 106MM recoil-less rifle mounted on a mule (A small flatbed one man vehicle) is blasting away at the buildings where we are receiving fire from. He fires and the enemy is dead! We finally make it to the medical college. Imagine my surprise, an Ohio boy finding an Ohio University medical school in Viet Nam in the middle of the largest single battle of the entire War. Working building to building we clear them and kill, capture or run them out. At nightfall. The NVA have retreated back into their buildings as have we. One on and one off watch all night, two hour watches. Clyde and I are in a Dental school building. I’m on watch. I sit in a dental chair swiveling 360 degrees and watch all the windows while Clyde sleeps. This is so surreal sitting in a dentist’s chair in the middle of Hue in the middle of a War. Morning. The word is passed. Gas masks! We are going to gas (CS Gas, a form of tear gas) the NVA across the street and then rush the building. 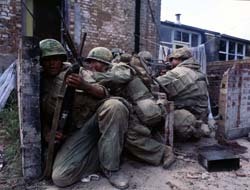 The grunts rush in and kill all the NVA in the building. Cpt. Downs and his radioman head for the door to cross the street. Mike, the Skipper’s radioman goes through the door first right in front of the Skipper, Clyde and I. Kaboom! We are all hurled to the floor. Looking up, Skipper is covered with blood and flesh as are Clyde and I. A P-40 rocket hit the radioman right in the face. The whole top half of his body is missing. Late morning. A government building of some kind across the street contains a large vault of some kind. We are told to blow it up and recover whatever important documents are contained inside. We were unsure how much C-4 to use. We don’t want to have to do this again. Kaboom! The explosion blows the vault door completely off and halfway destroys the vault itself. Piaster’s (South Vietnamese Currency) are flying everywhere. It is a bank! We just blew up a bank vault and money is flying everywhere. The Skipper looks through the rubble and we find very few documents. The Capital compound is surrounded by an 8 inch high concrete wall we cannot climb over it because they just pick us off one by one as we attempt to climb over. Engineers up! Cpt. Downs wants us to blow a large hole in this wall so we can rush the NVA in the compound. More C-4. A UPI news reporter is asking us if he can film us blowing up this wall. We said sure but you need to be way back. He takes a position 50 yards back where he can still see the wall but has some cover. Kaboom! The reporter is on his back, unhurt but a bit shell shocked. Our guys rush the buildings inside the compound and in minutes we have regained control of the buildings in the Capital compound. “Who has an American Flag,” asks Captain Ron Christmas of Golf Company. “I do sir,” says one of his men.”Bring down that garbage (NVA Flag) and run up our colors.” As the NVA Flag comes down and Old Glory is raised, you can see it all over the City. Fighting Marines see the flag going up and cheers go up from everywhere. We suddenly are overcome with emotion and patriotism as we realize the similarity with Iwo Jima. The Canal Bridge. Snipers! They killed one of our guys from a building across the canal bridge. We killed them and the next morning more took their place. The Skipper said to clear that house (a 3 story concrete house) and get those snipers! We cleared the house but each night they come back in. Cpt. Downs asks us to set up a command detonation on the other side of the canal from an office building where we had our battalion command CP. We hid 6- 20 lb. 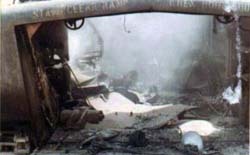 satchels of C-4 in the rubble at key structural spots in the building that would bring the building down with an electronic remote device controlled from the room on the other side of the canal. Nightfall. We watch the house with a twilight scope form our window. NVA start coming in, we can see them moving past windows. We watch for several hours while more and more move into the house. Once we see no new occupants we hit the switch and blow the building up. It heaves up a bit and then collapses into a pile. Next morning we search the rubble to many bodies: Six NVA soldiers, one woman and one small child. The horror of finding the child was overwhelming and devastating for me for decades. “Blow the bridge!” orders Cpt. Downs. The Lt and two other engineers from our Battalion are handling some of the demolition load. They bring shape charges to set on the bridge to blow it. As they are setting the charges, gunfire, the LT goes down. The other men scramble for cover. The LT is down in the middle of the bridge and no way to get him without exposing ourselves to heavy enemy fire. Clyde says, “Lets push a jeep out there and we can have some cover from behind while we recover the LT.” Clyde and I push the Mighty Mite (A Small Jeep) out to the center of the bridge right over top of the LT and pull him up into the back of the jeep. Then pull the jeep backwards to safety. The LT is hurt badly, several abdominal wounds. He is medevaced out and survives. 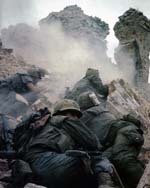 The Grunts finally kill all the NVA in the area and we blow the bridge late that day. Nuns! We are searching for enemy soldiers all over the city when we come to a Monastery of some kind. Everyone seems to be gone. We go inside a building with a long corridor and walk down it. The nuns come out of a door at the end of the corridor and walk towards us with their hands crossed in their selves and their heads down. As we pass they bow and say nothing continuing past 20 feet they suddenly turn and pull AK 47s from their robes and raise them to fire. We are quicker and cut them down. G-2 tells us sometime later that they found several NVA disguised as females in other places in the city as well. The Perfume River. 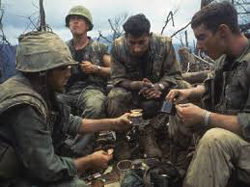 We could no longer cross to help 3rd Battalion on the other side of the river since we blew up the bridge, so we took boats across from west of the city and crossed to meet up with 3rd Bn, 5th Marines and we took back the Citadel after heavy fighting over the next two days. We spent the next several weeks chasing the rest of the NVA all over the countryside. After 42 days and nights we were relieved by units from Army 101st Airborne Division. We had killed and wounded more enemy in those 42 days than in any battle in the entire war. We sustained a couple hundred dead and wounded from that campaign and inflicted several thousand enemy casualties. One of the greatest battles in Marine Corps history. Our skipper Captain Mike Downs, Clyde and I survived without a scratch. Cpt. Downs finished his career as a Brigadier General and is retired; Clyde survived his tour and lives in Minnesota. Purple Heart: It was already hot. Could hardly get my breath all night. Like sleeping in a sauna. Cpl. Pete Bosco and I are packing to go on a 2 -3 day sweep with Hotel Co. The deal is (according to G2) the NVA have a company to regiment size detachment hiding in the area. 0500. June 21, 1968. Peninsula not far from Phu Bai. 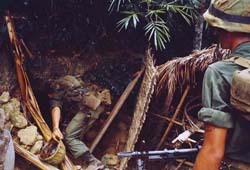 Believed to be factions of the remains of the post Tet force. 200 lbs C-4, blasting caps, det cord, fuse, and fuse lighters. Ready to go. 0700. It is already near 100 and humidity is 90%. Within a 1/2 mile we start finding weapons caches buried in the sand. )This peninsula is only about 7 miles long but our progress is slowed considerably by finding so many weapons caches. We have three Amtrak (Amphibious Tracked Transport Vehicles), two Tanks and all the supplies are in the Amtrak. We are of course on foot. Noon. 105 degrees and climbing. We capture a couple of suspected NVA. The Kit Carson Scouts (NVA Chieu Hoi defectors) and the ARVN (Soldiers of the Republic of South Viet Nam) begin to question them. The ARVN leader become very agitated with one prisoner and pulls out his knife and proceeds to cut open the prisoner’s abdomen from side to side and pull out his internal organs while he lives and screams. The other prisoner is taken away. Unbelievable cruelty by some of the Vietnamese to their counterparts. More weapons caches. We transfer supplies all to one Amtrak and store enemy ordinance in the 2nd track. The 3rd Track due to mechanical problems is limping along empty. 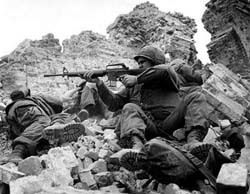 We capture no more enemy although two brief small firefights resulted in 3 NVA killed. We reach the end of the peninsula and find no enemy force. G2 says they have either left already or are behind us. 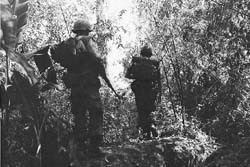 We start back to Phu Bai with a track full of supplies, a broken but able to move track and a track full of enemy weapons and explosives. The Amtracs plow through a fence line of small trees. The first one through, the second one starts through when KABOOM! This immense vehicle flies up into the air and flips over landing on its top. “Command detonated mine,” I shout to the Skipper. The Grunts immediately begin to set up a defensive perimeter as we move towards the now inverted track. I said to Pete, they are all dead. Just then the gunner (Amtrak have a machine gun mount on top) starts to crawl out from under the track. Amazingly somehow he has survived the blast but he is pinned underneath. Just as we are approaching to help him out the fuel cells rupture and burst into flames. The heat and flames prevent us from getting to the track and it immediately consumed the gunner who is burned alive while we could do nothing but watch. 1800. 110 degrees finally cooling off. The Corpsman came over and looked at us both lying side by side. “They are both alive.” He rolled me over and my left arm flopped out from under me. “It’s still attached,” he said. He began to look over us to see the visible extent of our wounds. I had the remains of my left kidney and some intestine hanging out of a gaping hole in my back just below the ribcage. I had a hole in between my ribs about halfway up my back that had torn up my left lung. A large piece of shrapnel was sticking out of the small of my back between two vertebrae. Another piece about 2-inches in diameter was sticking out of the back of my skull. There were shrapnel puncture wounds all over the back, left arm, left leg, left side. One Corpsman spoke in medical terms to the other about what they were discovering. I had been in combat for most of the 6 months I had been in country so I understood enough of what they were saying to know it was not looking too good. They carried Pete and I into an Amtrak and called for medevac. The medevac chopper crew said they would not come in the dark while we were under fire. We could not give them illumination to land without exposing our position. Just then an Air Force medevac chopper who was in the area answered the call for two priority one medevacs. He said he would attempt it if they could talk him down to the ground. 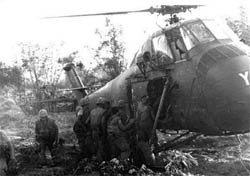 He flew in without illumination at night and picked Pete and I up and had us in Phu Bai 1st Medical Battalion in 20 minutes. When we arrived they took us both into emergency surgery. I was slipping in and out of consciousness and I remember the doctors saying, “His veins have collapsed, do a cut down in the groin.” While I was awake and not medicated, they took a knife and cut my artery open and fed a tube in. That is the last thing I remember until the next day sometime. That was to be the last day in combat in my very brief Marine Corps career. When I awoke the next day I was in an Intensive care ward with Pete in the bed next to me. He was alive and his wounds and mine were similar. Neither of us had lost any limbs but both of us were experiencing paralysis in parts of our body. Both had lung damage. 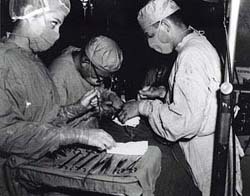 Mine resulted in the removal of the left lung and left kidney. He had not lost any organs. We both were very happy to be alive. The Battalion Commander and staff came in later to award us our Purple Hearts and to tell us we were going home. I spent a year in the hospital. A couple of month in Yokosuka Naval Hospital in Japan, a couple of months in the Wright-Patterson Air Force Hospital in Dayton Ohio. I got to go home for 2 weeks and spent the whole time in bed. 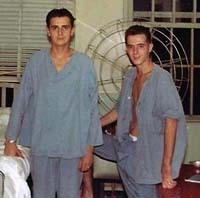 The remainder of the year I spent in Philadelphia Naval Hospital until I was medically retired, June 17, 1969. I was also married on June 21, 1969. The Happiest day of my life. I am a combat wounded survivor. 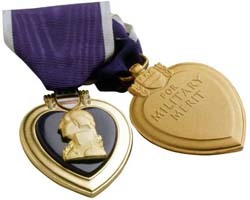 Purple Heart received for not ducking soon enough! Purple Heart. I spent a year in the hospital and had 13 surgeries. I fought for my life and have been restored by God’s amazing Grace. I lost my left lung, left kidney and the use of my left arm. God restored the use of my arm after a year and a half. I have shrapnel in the back of my head, back, left shoulder and arm, left side and left leg. Only by God’s grace am I still alive. Corporal Clyde Dillenberg. He taught me how to do an awesome job and still stay alive. Clyde and his family and I have reconnected after over 40 years as a result of TWS. He is my life long brother and friend. Thank God! 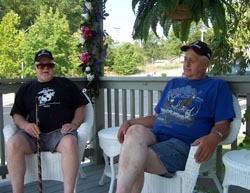 Photo is Clyde and I relaxing on the porch, shading ourselves from the hot sun. That is me on the left. Seems an AK-47 round went right through a can on my back pack. We still laugh about that today. I was a carpenter for 24-yrs, self-employed remodeling and single family homes. 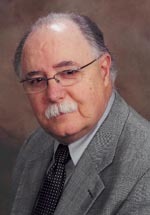 I have been a Financial Planner since I retired in 2010. Now I’m a full time Grandpa and active in military groups and Church life. Marine Corps Engineer Association, Chaplain. MCEA brought me to TWS. Military order of the Purple Heart Chapter 500 Columbus Ohio. I’m second Vice Commander and web forum manager. I love serving as Chaplain for several other Marine and Military forums as well. I’m now Commander of MOPH Ohio #500. I love to search and post on a bunch of Marine and military forums and FB forums. I’m passionate, driven, tenacious, and successful. I learned leadership and confidence as well as personal accountability in the Marines. I would do it again in a heart beat. Learning to be under authority and adapt and overcome has served me well all my life. BASED ON YOUR OWN EXPERIENCES, WHAT ADVICE WOULD YOU GIVE TO THOSE WHO HAVE RECENTLY JOINED THE MARINE CORPS? You will never again feel the Esprit de Corps as powerfully as you will while serving. Your memories will be with you for a lifetime. The best friends of your life will always be Marines. I enjoy re-connecting with current serving and Marines from my era. I have met some great folks here. My recovery from severe PTSD has been greatly enhanced by sharing those memories, both horrifying and humorous with my brothers. God Bless TWS.